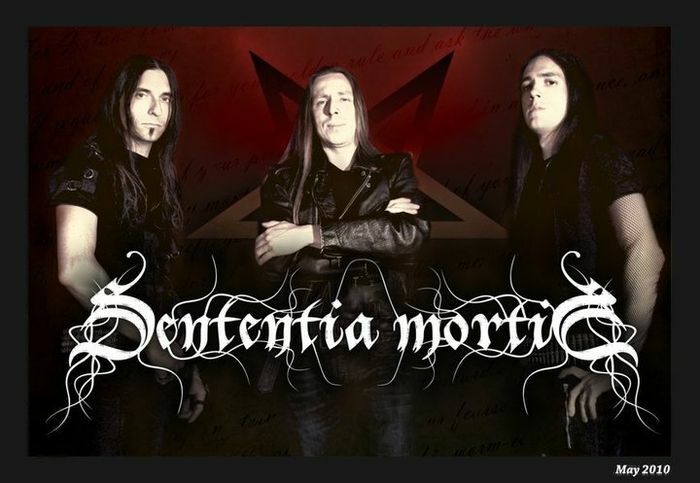 What made you call the band "Sententia Mortis"? The idea that makes me think we are too much in the world. How was the band formed? At the beginning with friends trying to play something old school...old school simphonic black metal. Where are all band members from?/Who does what in the band? They are all from Italy even if now I'm working alone in this project.But Groeber was on bass and Mauron on Vocals. Me on guitars and keyboards. What was the ambitions of the band when you started? To bring back some old school sounds...nothing to do with live shows,money or what else. Could you explain your music to someone that haven't heard you? Imagine very dark atmospheres,with sharp guitars,very fast drum and a voice that explain what hate really is. Where was your first gig? No gigs with Sententia Mortis...this is a studio project. Italy is not the right place for this sound. Who has the best since of humor in the band? Mauron was for sure...ahah very nice guy. What's good/bad with the band?/What genre do you feel you are? At the moment there's only a bad thing....time.Not so much...and being alone to play all instruments is not so easy. Why did you pick that particular style?/What are your songs about? Because I lived the early years of 90s listening to simphonic black and that's my favourite. SM talk about the human violence against nature,against animals.Also about the fight between God and Satan. Have you made any albums?/If yes what are they? Two albums are done "Mother Earthquake" (2010) - considered by some zines as a demo...but is not. "Verbum Inferi" (2012) - second full lenght.Now working on third an last album. Do you have any clips on YouTube? You can search for Sententia Mortis channel on youtube...but no particular videos produced. How old are you?/What got you started in music? I'm 34 and starded following my father...also a musician. At what age did you start playing? At the age of 14/15 I had my first guitar. How old were you guys when you first stood on stage? Not with SM...but first time was when I was 16 years old for me. How big crowds do you usually play for? Hmm...I think 1500 here in Italy. What are the plans for the rest of the year? Finish the last Sententia Mortis album. Where do you usually play? At home. What are your goals with your music? Making and recording something I like. When did you decide to go all in for the music? When I finished school. Is it easier to get your inspiration from older bands or from bands more modern? Esier from old bands because they play the way I prefer...but I don't hate new bands with good ideas. What are your sources of inspiration? Dimmu Borgir,Emperor and my life. What's the first step when making a new song? Turn on the keyboard or guitar and...magic. What would be your dreams for the band? A dream? to be in a big record label...but only for a big distribution,to let people listen to our music. Besides your own music, what genres and bands do you listen to? I listen to metal in general,classic,new age, sometimes old disco,new wave and 80s. What do you hold most dear? My girlfriend and my music. When you are on stage, what do you fear most then? Technical problems haahha! What songs and what years were they released? Two albums are done "Mother Earthquake" (2010) - considered by some zines as a demo...but is not. "Verbum Inferi" (2012) - second full lenght.Now working on third an last album. Have you been in any other bands? Yes,many other. How important are your fans? They are important of course, even if I'm not famous enought to give you this answer. Where do you rehearse? At home. Name 2 of your own songs you like at the moment? "Proelium" and "Enemies Of Existence"
What drives a band that isn't all that famous and renowned to try to make a living on their music and to keep playing? The music passion is the key. Do you have any webpages? Sententia Mortis on Facebook and YouTube...we had also myspace but....probably dead?? (hate myspace). Any pearls of wisdom for all other bands out there? Study music,play as much as you can and learn to listen. What are the biggest obstacles for a band? Money, atmosphere between band members and the place where the band lives. What is best/worst with playing the clubs? Bad sounds,not enought time and no people.